Vocabulary is the key to learning a language. Oftentimes, the mastery of a foreign language is measured by the number of words that you know. While the grammar is finite and it's possible to learn all the rules of the Russian grammar, the vocabulary is endless and it's hardly possible to learn all the words existing in the Russian language. You need to build your vocabulary continuously throughout your Russian study. 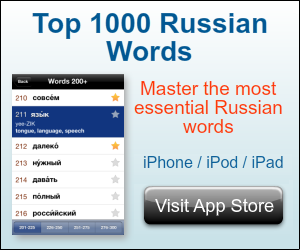 To make it easier for you to increase your Russian vocabulary we have created all kinds of vocabulary lists, lessons and audio recordings. Russian belongs to the Slavic languages and doesn't share much vocabulary with the English language. Although most Russian words will be new to you as an English speaker, it is always a good idea to learn a few cognates--words that are almost identical in both Russian and English. However, be careful with so called false friends that are similar in pronunciation but have different meanings. For example, the Russian word "магазин" is translated as "a store, shop" but sounds almost like the English word "magazine" that has a totally different meaning. Whether you are a beginning or continuing learner of Russian our frequency lists will help you with learning and remembering most common Russian words. Frequency lists show most widely used words from modern fiction, newspapers, science and political texts and provide an opportunity to focus on Russian vocabulary that is essential in most situations. And whenever you find yourself in a specific situation, such as shopping, banking, dining, staying at a hotel, or visiting a doctor, our Russian phrasebook and topical lists will have all the words and phrases you may need. You will need a good dictionary when learning Russian. Dictionaries come on all shapes, sizes and specializations and you probably already have one or two. Just to make things easier for you, this site provides a free online dictionary for translation of words and an online translator for translation of phrases. The dictionaries are compiled by professors and guarantee to have proper translations. However, please note that electronic online translators provide only machine translations that are prone to mistakes. Machine translations are great if you want to get a general idea of what the text is about. They sometimes give very accurate translations but we don't recommend to rely on them for memorizing new vocabulary without either double-checking the accuracy of translation with your teacher, consulting with a Russian native, or looking up the words in question in an academic dictionary. There are many techniques to memorize new vocabulary. Traditional methods suggest that you create lists of words, sticky notes or cards for frequent review. You could also print out Russian words and tape them on the things they represent around your house. For example, put the word "зеркало" on your mirror. This lets you see the Russian word for these things daily, which will improve your vocabulary. However, traditional methods can be tedious and ineffective. To make things more fun we have created flash cards for more interactive learning without endless lists. Flash cards introduce an element of entertainment and make learning Russian words and phrases more interesting. There are also many vocabulary learning software programs on the Web. Not only they are designed to build your vocabulary in a fun and interactive way but they usually come with tests and quizzes that help maximize your retention. We provide links to software programs that are free, receive good revies, and will help you benefit from technology in language learning.